Nowadays, companies in each and every sector are trying to better understand their customers. Customer Relationship Management (CRM), customer-centric management, contact-client are so many customer-based strategies. Throughout decades, we came from a « product-based management » to a « customer-based management ». We used to read books about how to increase the profit by having a better lean management, building a factory to produce more with lesser cost and lower price. Now, we have so many books treating about how to tackle the market by increasing the customer-experience, entertaining the community, sharing the values with your consumers, how to communicate directly to your target, etc. So who are the customers of today, in 2015? And how would be the ones of Tomorrow, in 2020? A « motto » for some companies, a « nightmare » for some other companies/employees; at least this became a rule for marketing & customer relationship. « The customer is always right », « Customer needs to be pleased », these are all the sentences that rule some service-companies. Those companies are providing mostly services such as Airline companies, Casino, Bars, Restaurants, and some boutiques in luxury. Employees need to please the convenience and conditions of the customers. 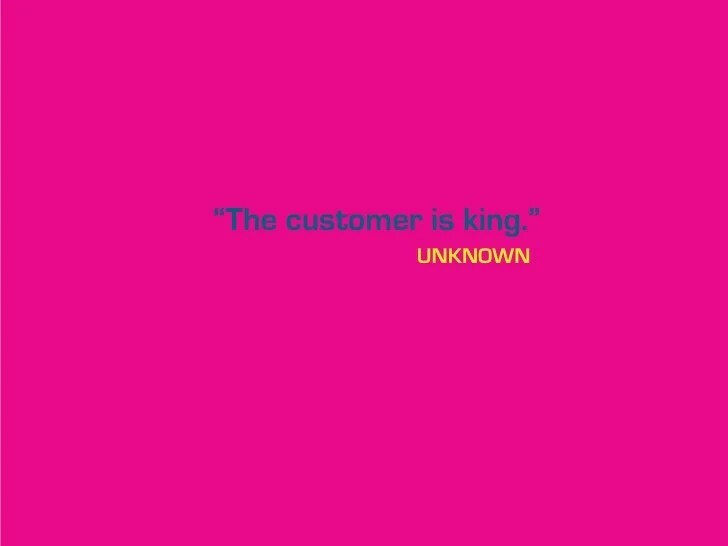 Why « customer is king » is working ? Whether your investment in marketing/communication is important and well studied, the perception of the customer is the key. Many companies invested enormous amount of money on product/service promotion with a very low brand recognition/brand recall. If the customers do not see why your business is different than your competitor’s, why will they keep coming to yours? Customer Relationship is the key to build a loyal community of consumers. They will appreciate your brand when they perceive them well and criticize you whenever they feel it wrong. Companies should communicate to their targeted audience, not sharing the values that they want to share or promote. Promoting your very comfortable retirement policy to your customers if you are Pampers is not really relevant. But promoting « Mothers » as their core value when you know that they are the ones who will buy your products is much more relevant. We are no more in the « product-based era ». We were able to increase the number of sales if we cut the cost significantly and reducing the price. Henry Ford principle of mass production embodied the general situation of the 20th century (Read more here). But, in today’s world, we are no more able to acquire a customer just by reducing the prices. Customers want to choose. Customers are looking beyond an attractive packaging and prices. The lowest cost are no more the best-sellers. Sophistication needs to be justified. They want to understand what they consume, what they buy. So when you have convinced a customer to buy your products, to invest on your service, it is cheaper to please them rather than acquire a new one. The cost of customer acquisition increased as companies need to multiply the touchpoints (TV remains the most expensive cost but new media increased the cost – Facebook Ads, Ad Words with Google, Twitter Sponsored Tweet, Youtube pre-rolls, etc.). In order to seduce new customers, companies need to invest on digital advertising as much as on « traditional advertising » to make the customers aware of the brand. But investing on « the pool of customers » that they already have is cheaper. Brands invest on the customer relationship to maintain their actual business activity without taking risks to lose. With social media, the brands are victims are the flaws that they might have. Nowadays, they meet the obstacles of the community immediately within hours. Brands should become more « listeners » than « talkers ». As told before, the customer’s perception is crucial to make the business living. The number one seller is not the employees but the customers themselves. Customers would identify the drawbacks and get back to the brand very quickly. The brand should use them to patch the « holes » and need to reward their proactive customers rather than see as an « obstacle to sell ». 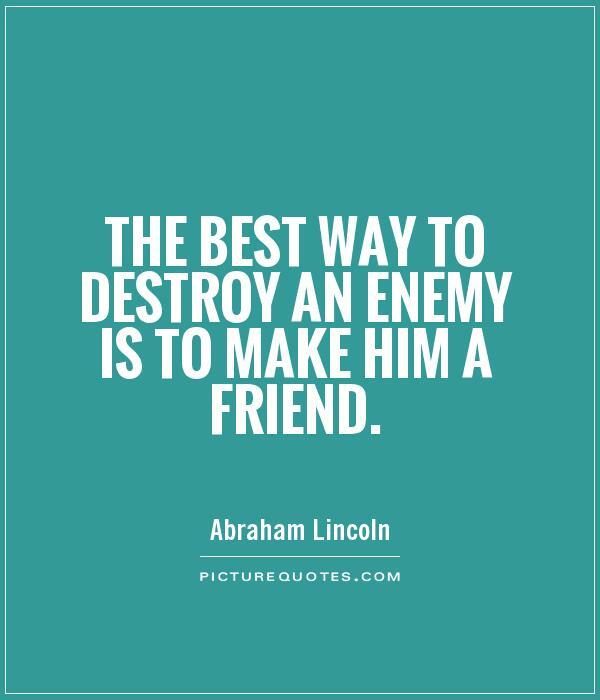 As Abraham Lincoln said, « the best way to destroy an enemy is to make him a friend ». In this case, the customers should not be considered as enemy but potential future seller of your brand. Why? Because if they feel listened and appreciated, they will tell to others, share on their social networks. This would help to increase the « bubbling effect » – you pop a bubble (problem) and it will pop the others. You can read an interesting article about how brand should react to « fans who hack your brand« . How can we run a business without customers? You need to please them to make your living. This is a simple rule, but should be the core of the way you think your strategy. You make products and/or services to please a need, to satisfy a lack of service, to make them « happy » with your product/service. You can make a sustainable profit if they are loyal to your brand. This would happen if you take time to consider the consumer as your strength and backbone of your corporate strategy. Who is the customer of today? Today’s customer is connected to all the social networks. Those customers are aware of all the news through branded contents but also contents produced by other customers. They share the word very quickly within seconds. They can create a movement in few hours to criticize and/or support a cause. They are a well-known anonymous. They are anyone, individuals but sometimes act like a group. Brands need to understand those characteristics. The customers of today are dynamic and top-bottom communication would no longer work if it is the only way of communication. Brands need to empower their customers and get fed by the customers’ energy, cheerings. Let them participate to challenges, let them guide brand’s strategy to a much suitable way to the market. Brands should communicate to those proactive customers who want to have their word to those who accompany their daily life. Ecology, sustainable development, ethical business are all those values that people are looking after. The past decade had been the « booming era » for those « green businesses ». Generation X is concerned by the Global Warming, Generation Y is becoming activist by sharing their thoughts, trying to adapt their consumption to be eco-friendly, Generation Z would become even more active by being eco-responsible. The Corporate Social Responsability is now a heart of the global corporate strategy in each and every big company. Companies are proud to invest a part of their budget to market their eco-friendly business process, their effort to keep the Earth better, their ethical policy towards customers but also employees, their accreditations from big organisations who are eco-responsible (ISO, Fair Trade labels, Best Place to Work, etc.). They need to communicate all that because of the consumers. The customers want to buy brands that are engaged in sustainable development strategy, ethical, socially engaged. They want to act through their action of buying, even if the prices are slightly higher than before. It helps to satisfy their conscious of « an eco-friendly consumption ». The Vegan movement is one of the example of this new type of awareness, as much as the development of the Fair Trade economy. Customers are no longer « passive ». They want an active role in the economy and in what they consume. Apart from their professional careers, they invest their leisure time on what they feel « important for themselves ». They share it to their surroundings, their « bubble ». Generation X has in their genetic code the « entrepreunarial spirit ». This chart represents the overall age of Entrepreneurs in NYC in the Tech’ industry. We can see the number of entrepreuneurs increased and is important for the age group of 25-35. People are tend to take initiatives and take the risk to develop their own businesses. Likewise, the customers’ profile evolved along with that entrepreunarial spirit. Customers want to participate not only on what/how brands communicate but also how the product is produced. We call them the « prosumers » (producers + consumers). They produce their own products with the tools created by the brands : mycereal.com, NikeID, Citroën C4, etc. The ultra-customization syndrome is just a consequence of that « envy ». Brands start taking into consideration this evolution (you can read more of this subject with the book of Ann Handley – Everybody writes). So, who is the customer of Tomorrow? All those trends are giving us the hints to market efficiently our brands (as persons, as people, as companies and as organisations). They will be selective in terms of information, products, services and brands. They want the « truth » and they will select the channels of information to have the more relevant informations to them. They will share the brands if they care of them. They will have the power to develop the brands are to kill them with bad publicity. They want to care of others, so brands need to vehicle positive values that people could trust and rely on. We are clearly in the « Green Business era », and we will still be on that approach for the future decades. Alternative energy, lean management, carbon-emission control, recycling, eco-friendly consumption, eco-mobility will be more and more developed. Customers would look into those aspects of their lives. Generations Y & Z are victims of what Human used to pollute, so the will feel responsible of what is happening to Earth and try to act to tackle this situation. Customers are already wanting to co-create the products. They are all wanting the best products for themselves and the products or services that are perfectly suitable for them. So their participation in the economy will be more and more important : development of the Bitcoin or another virtual currency, consumer-shareholder status, co-marketing, consumer-sellers, brand local ambassadors, etc. Brands would empower the customers as much as possible. The consumers would have less time as they would probably work from their home but for several companies in a same day. Telework would become the « conventional way to work » with project-based contracts. So consumers will have lesser time to spend on purchasing but possibly more leisure time as they will manage their timetable. They will adjust their time and will be well fed of news, so they would take time to write and share their feedbacks on brands, discuss with the new community gurus (Youtubers, Viners, Instagrammers, Bloggers, etc.). Those Social Gurus would become the ultimate influencors. So, the customers of tomorrow will have the power to develop a business or not. Brands should evolve with its time and adapt their marketing strategy & brand strategy all the time to the market/consumers. They need to serve the customers and make them enjoy the brand to become a lifetime partner. Brands need to create a relevant bottom-up marketing strategy rather than the old top-bottom strategy. Article suivant Faire des économies sur le TCO, fiction ou réalité? Spécialiste du Marketing Digital, fasciné par ce monde en constante évolution, j’ai la chance de travailler dans ce milieu en amenant mon dynamisme et mon enthousiasme. Convaincu par la philosophie « out-of-the-box thinking » pour apporter une véritable plus-value; j’applique cette vision sur chacun de mes projets. Je m’inspire en lisant les ouvrages et suivant les « pitches » de Seth Godin, Grant Cardone, Gary Vaynerchuk ou encore Steli Efti. J’ai pu gagner au fil des années en expertise dans la partie Sales sur divers typologie. Me voilà désormais à transmettre mon expérience.